a booking form will be sent. Volunters are desperately needed to help organise The Muswell Hill Festival this year - or it could be scaled down. That's the warning from festival organisers, who say the festival has become such a popular event that it'll need all hands on deck to make it work. Liz Luxmore, spokeswoman for the festival said: "The festival has become such a big thing, we need more help with it" "We would also like to get children involved with stalls for them, but we need people who can run them." The Festival is pencilled in for July 14th, and is set to run from 2pm to 8pm. As usual the focus of the event will be Fortis Green, and attractions will include live entertainment and stalls. Last year's event had two stages and 100 stalls promoting local crafts people - but a power hitch caused the show to run overtime. 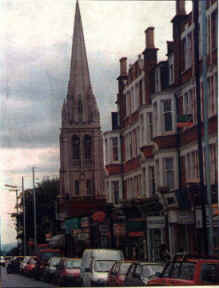 Haringey Council was preparing to pull the plug when O'Neill's pub in Muswell Hill Broadway saved the day by offering to host the final act. Mrs Luxmore said: "We expect a good turnout. The day has always been very popular, which is why we need more help. We'll just have to hope the weather is good."